Marshman 2011 – A mixed bag…. Before I start this race report please understand it is for you to read as much as for me to keep a record of my race (hence it includes lots of detail you probably don’t want!!). So the prep for the race didn’t actually start on Sunday morning but two days before. My single biggest challenge in racing anything over Olympic (1500m/40km/10km) distance is nutrition, on all of my major races (UK70.3/WCMD/IMCH) I have had nutrition disasters that have ranged from bloating to nausea, vomiting, diarrhoea, cramps, etc they normally start about half way through the bike and continue throughout the run. I have tried various High5, Powerbar, Maximuscle, Buzzbar, Nakd products for nutrition but every time I have had the same issues. This time I wanted to crack it, so I started by thinking about my prerace nutrition slightly more. My main consideration was getting carbs and some protein in with limited amounts of fat and foods that are known to cause bloating/gas. Basically this meant a really boring diet for Lizzie for the two days before the race! On Friday I started to reduce the amount of fibre in my diet (cutting out uncooked fruit/veg) and started to up the fluid intake (using half concentrate (1/2 a Nuun tablet in 500ml water). From Saturday am it was limit fibre as much as possible and focus on consuming carbs and some protein. Breakfast was poached eggs on white (no wholemeal at all) toast, lunch was a challenge as we were out at a brasserie, so I opted for beer battered fish and chips (minus the peas and tartar sauce) with water. In the evening we had pasta with green pesto and I made sure that this was all finished by 7.15pm (just under 12 hours before the race) – all the way through the day it was dilute nuun to drink (triberry flavour). No alcohol within 72hrs of the race (hard as we had a birthday party to go to the night before it!). I slept surprisingly well on Saturday night – going to bed by 10pm up at 3am 😯 to eat breakfast and head out. So a 3am get up for a 7am race…early!!! I had to drive to Lydd from Cambridge so I thought I would leave at least 2hrs – plus it meant I could try out my new pre race plan. I got up (and got the dogs up – they were not happy) and went for a 10min walk/jog to wake up, I then had breakfast – 40g/195ml of Scotts Old Fashion Porrage Oats/water with 500ml of Nuun (I tried Zipvit energy drink but it was not nice….). After a quick drive down to Lydd sipping Nuun all the way I registered and racked my bike – necking 2 Zipvit gels at 60 and 45mins before the race. The racking was a mixed affair, part carpeted, part grass/soil – which became mud after the swim :-(, but at least it was numbered. The race briefing was short and then it was straight into the water to go – I was in wave Alpha. It was a deep water start and I placed myself as I usually do on the inside path to the first buoy near the front (all of my other races this positioning has served me well). I was about three/four people back from the front as the race started – it was one of the most competitive deep water starts I have done, it was really aggressive with lots of hands and elbows. This usually does not worry me however this was also my first time in the wetsuit for the year (plus I had not sealed it properly so my left arm was a bit full of water) all in all not a good start, it just did not feel right and at 200m I was going backwards….what really did not help was what happened next. I was jockeying for position with the swimmer to my right (oldish chap in a white club swim cap – I had seen him in transition) and he obviously got fed up with it as just as I put my head to the left to breath he pushed me under on his stroke and pulled my goggles off with his fingers (before the race I had tightened my goggles up so I know it was not an accident, ie. knocking them off). I immediately slowed and had to half swim/tread water to empty them (the water quality there is awful – really green and nasty tasting) which meant I got smacked into by the people swimming behind me. Once I had cleared my goggles I started swimming again – my confidence was a little knocked and it was the closest I have been to rolling on my back and putting my arm up in the air and DNFing in a swim – it was that close…. I persevered and pushed through the swim – passing the 300m buoy in clear water I began to pick up pace and chase down the front pack. The first turn was a bit of a mess as was the second (the swim course was a big M – 600m out and back with a 300m stretch making up the middle of the M) but the final turn was a perfect quick affair which took me passed two others. 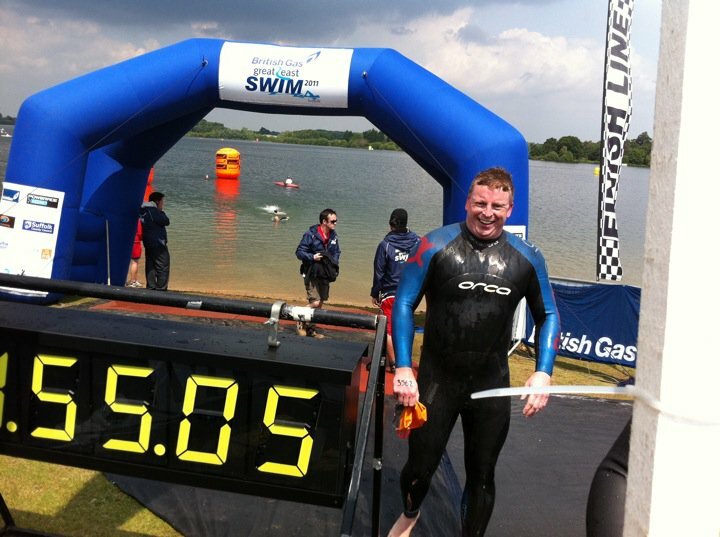 I finished the swim in 29th place in 30:32 – not my worst but not my best 1900m race effort. The exit was a slipway that led directly onto transition. I raced up it and down to my bike (not missing it like at WCMD last year!) and started to de wetsuit, however my bike was in a soil area so it all soon turned to mud – what a mess, plus I was pretty dizzy – T1 did not go well 4:12, it could have been faster – maybe no arm warmers next time (or at least roll them!) – once that was over it was out onto the bike. The bike will be the defining memory to me of this race, I mounted well and pushed out onto the course zipping past the spectators and the Race HQ and off towards the course…and a good bike time….and that is how I hoped it would have gone, instead about 500m out from the Race HQ I tried to change up onto the large chainring and all I hear was a mechanical shearing sound and then I was pedalling like a maniac and slowing down…I looked down….no chain….I stopped and got of my bike…and swore at it….jumped up and down and swore some more…..ran back picked up my chain…realised that either end where it had failed had been damaged (the ends were chamfered in so a speedlink would not work)…ran back to my bike and swore a bit more….thought “well that is it game over – 30mins in – bugger” and then thought – multitool – I can take off the broken links and put the chain back on shorter and just race on the gears I can make…sorted! So I got out my multitool with chainbreaker and then realised that you need a no.6 hex spanner to use it – my only one was attached to the multitool…more swearing…..all the time people were zipping past me asking if I was okay…I wasn’t…..after I had sat there for a couple of minutes I realised there was a mechanic at Race HQ it was only 500m (ish) back so I picked up my bike and chain and legged it over the parking field to the HQ. The mechanics were all having a cup of coffee but after some persuading they fitted a new chain and I was sorted…well kind of….I had pretty much convinced myself that my race was over, to then try and psych myself back up to carry on for another 6hrs was tough, and I mean really tough…. I got back out on the bike course and I pushed as hard as I could whilst trying to keep to plan – I was aiming for Z3 throughout (147-160bpm) as it was I kept it near 163-165 throughout. The bike course itself is not challenging on this course – climbing was around 200m and 40m of that is on one hill…there are some fast bits but mostly it was a steady state effort – the biggest challenge being the headwind – it was simply amazing, to give an example there was one bit where I turned a corner and my speed dropped from 34kph to 14…..hard work. From a nutrition perspective it all felt good – I drank fairly freely (Nuun triberry), making sure I was taking on fluids at least every 10mins and I took a Zipvit gel every 30 mins. For the first time on a 70.3 or IM bike – no GI issues and no cramping!!! However I think I may not have taken enough carbs before the race as everything felt flat – not sure why….also a first on the bike – I was overtaking people…not done that before…all the same I wonder if I should go back to a 54/39 rather than a 50/34 on the TT bike…average cadence 80…. I came back into transition in 3:31 (190th place for the bike) feeling a little dejected but overall at least I had made it round. T2 was smoother than T1. I racked my bike and stripped to my trikit to run – I paused long enough though to clean the mud off my feet (carpeted transition…hmmmm) and put on my fuelbelt and off I went. The run route has changed from the out and back death march that was apparently last years route. Instead it is a run from Lydd to Brookland and back – it is a pleasant route with several places where you run either side of the road – it was nice to see other people! I struggled from the off to get my cadence up – I usually run at 90-95 strides/min but 80-85 seemed to be all my legs could do so I switched of my Garmin alarm telling me my cadence was low and just went with the flow. Everything felt fairly good on the run, nice and fluid no real pain in the legs – I saw Mike (my coach) heading back in (he had a stormer, finishing in 4:47) and the pace felt manageable, if a little slow 6:30-6:45/km – I usually run 5:50-6:00. At about 1:38 into the run the wheels fell off…probably due to too many carbs being pushed or that I had mixed a caffeine Zipvit gel in to see what happened…but I started to develop GI cramp and pain…I took some Colofac (mebeverine – a GI antispasmodic) which started to work around 10mins later but for around 3km I had a completely flat spot – it was a mix of nausea/GI pain and occasional vomiting…however with about 2km to go things seemed to improve and despite having a stitch I pushed through and finished fairly strong (6:20/km pace). I finished the run in 2:23:22 (182nd place for the run) which I was fairly happy about as my fastest fresh ½ marathon time in 2:14. In total I came in 183rd in 6:35:14, only 5mins slower than my expected time and that included the goggles and chain fiasco, so all in all fairly happy. As to whether I would do the Marshman again, not sure. It is an okay race, okay swim (although dubious water quality), fairly flat bike and run routes and it has FANTASTIC post race massage (approx 45min massage – although I had to wait about an hour for it!) – but it didn’t give me the same positive feel as the West Cornwall last year (and no beer at the end!). Overall though – good race. Last night and today – turbo sessions – OMG Mike has developed new ways to induce pain on the machine!!! Mostly it went well but really feeling the pace being upped in the build phase – legs are buzzing at the moment…gears are all over the place on my Aerotic though – I need to index them again before Saturday! INTO 5 X 30 seocnds spin ups (RPE 13-14) RPM 100+ with equal recovery in b/t. MS: 20, 15, 15, 10, mins @ 75, 80, 85, 90% All Straight through – NO REST! MS: 4, 4, 2, 2, 6, 6, 4, 4 (75%) 2, 2, 6, 6, 4, 4 (80%) as RPM 95+, overgearing 60RPM (heavy) LCR, Repeat straight through. – NO REST! CD: 5min easy cool down. I found it really hard to keep the RPM up on todays efforts! Anyway swim and recovery run tomorrow – probably with Anja in tow on the run!